This fort is based on the flat land near Narayangaon village. Narayangaon fort must have been of a high importance as it was located near to the ancient trade route of Naneghat, Shivneri fort and Junnar market place. The rock cut steps and water tanks indicate that the fort might have been built during the Satvahan era. The area of Narayangaon has come back to limelight dur to the installation of Giant Metrewave Radio Telescope (GMRT) at Khodad village. This telescope can be seen while approaching the fort and also from its top. This fort can be easily visited in one day. It takes about 10 minutes to reach the rock cut steps from the base village temple of Mukaidevi and further 10 minutes to reach the fort. There are two small hills on the fort to the either side of the doorway which can be seen after we enter the fort. The temple of Goddess Hastamata is on the left hill and there is a proper marked route to the temple as it is frequently visited by the villagers. While walking towards the temple there is a small descending path to the left which takes us to the rock cut water tanks. Heading back to the original temple route and walking further there is are remnants of a mansion. Two stones carved with the sculpture of Sharabh and the door-strip carved with a small Lord Ganesh idol can be seen here. Continue towards the Hastamata temple which is the highest point on the fort. Below the top edge of the newly built temple there is the ancient temple till present. 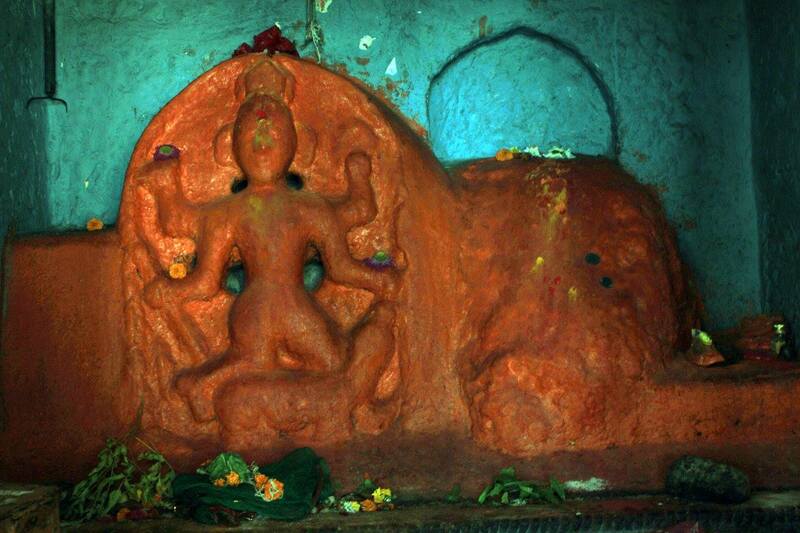 The main hall of the temple is about 4 feet high and has a stone carving of Tandala and an idol of Goddess Hastamata. After visiting this head back to the entrance of the fort on the opposite side and proceed towards the another hill by keeping the valley to our left and the hill to our right. There is a pillared water tank on this way which is known as Narayan tank. Moving ahead on the route and descending to the side of the valley we come across a hidden doorway in the bushes. As this part is covered in dense vegetation a local guide could help to reach here. Going back to the main entrance and keeping he hill to our left and valley to our right proceed further to reach a group of five water tanks. While coming back to the entrance of the fort there is another tank on the edge, above the steps and there are remnants of fortification wall in front of this water tank. It takes about one hour to visit the entire fort. 1) Once we turn on the road to Pune from Alefata, after 2 kms there is a newly built toll booth. After crossing this there is a bridge built over Kukdi river. Just after the bridge there is an unpaved road to the left passing by a canal. This road joins ahead to the road coming from Narayangaon village and further leads to the temple of Goddess Mukaidevi at the base village. This is the shortest route to access the fort if coming from Mumbai. But as the majority of the road is unpaved it renders unfit in the rainy season and thus should be avoided. Alefata to Mukaidevi temple on this route is 16 lkms. 2) Reach Narayangaon from Alefata. A road opposite to the S.T> stand of Narayangaon goes to Khodad village. At 9 kms distance on this route we come across a junction from where the straight road goes to Khodad village and the road to the left goes to the base village Mukaidevi temple via Gadachiwadi village. Narayangaon to Mukaidevi temple on this route is 10.5 kms. If we get down on the junction by taking a bus from Narayangaon to Khodad, it takes about 30 minutes to reach the base village temple. 10 persons can be accommodated in Mukaidevi temple at the fort base or at the Hastamata temple on the fort. Water available in the tanks on the fort is not potable.